In this section, you are going to learn how to enable/disable NS Recipe main features. It all depends on what you want to use NS Recipe for. 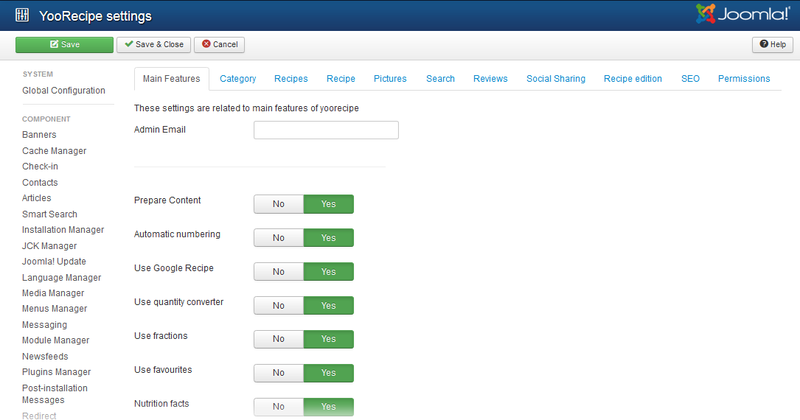 You can enter an email address which will receive notifications about recipes, reviews, and creations. Whether or not you will use Content Plugins in your recipes. See Use Content Plugins documentation for more information. Whether or not paragraphs in recipe preparation are turned into an ordered list. See Automatic Numbering Explained for more information. Whether or not microformats are enabled in your recipe pages. See Google Rich Snippets for more information. Whether or not ingredients quantities can be converted on the fly. US vs metrics display of quantities. Whether or not pictures are watermarked with a copyright of your website. Enable/Disable shopping list features (add to shopping list buttons, etc). Enable/Disable Meal Planner features (add to recipe box buttons, etc). Privacy setting: Either display real username or avatar. Pagination position. Can be top, bottom, or both. Enable/Disable price support for ingredients. Enable/Disable price support for recipes.